A special brand of Fundamentalism called King James Onlyism is a particularly odd variety of faith simply because of its required backing and filling. In brief, this particular evangelical position claims that the only inspired translation of the Bible is the King James Version. It’s best not to look too closely at the KJV, however, or the problems start. Primary among them is that the version most Onlyists cite is not the original King James. Published in 1611, this translation is immediately evident by its use of “I” for “J” and for the long s (the one that looks like an f). Perhaps more troubling for Onlyists, it also includes the Apocrypha. There was still some debate at the time concerning the status of these deuterocanonical books, and they were part of the actual KJV. 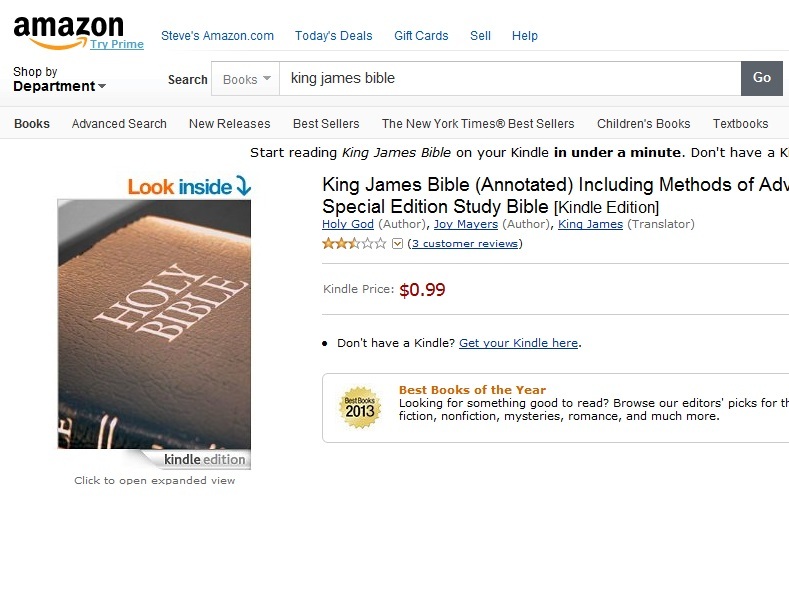 The typical King James used by Onlyists is a revised KJV. In England, where the translation was done, revisions were made from time to time, leading to an Oxford version (Blayney text of 1769) and a Cambridge version (Scrivener text of 1873). On these shores further adjustments were made leading to the rather strange situation where there is no single King James Version of the Bible. There are many King James Versions. Attempts to control Scripture often end up like that. The underlying problem is the belief that there is a single version of Holy Writ. Inerrantists are pledging their faith to something that doesn’t exist. Defending this approach many would claim that the revisions are minor, but small changes can make huge differences. The belief in one single version relies on the belief that God inspired not only the original writers, but the translators as well. It denies that the better manuscripts that have come to light since the early seventeenth century (including the Dead Sea Scrolls) contain any authentic information of what the Good Book says. Textual criticism, in the absence of any original manuscripts, is the best way we have of discovering what the original likely said. Onlyists argue that the manuscripts from which King James’ translators worked were the divinely selected ones and their work was inspired—a position against which no empirical proof can be offered. This faith trades in certainties that only bringing in direct heavenly control can achieve. And it means that Catholics are wrong, despite King James’ inspired error to include the Apocrypha. That’s the thing about a trump card like inspiration—once it’s played there’s no way to overcome it. One of my most frequent imaginary dalliances is wondering what I would have done with my life if I hadn’t been raised religious. Like many young boys I found “exciting” jobs enticing—soldier, firefighter, explorer—but scientist also loomed large in my imaginary horizon. By the time I was a teen I was firmly ensconced in books. My upbringing meant that many of these books were religious in nature, and my concern with ultimate consequences meant religion was the only possible career track to make any sense. It certainly never made dollars. As someone who professionally looks backwards, I’ve found myself wondering if I shouldn’t have focused on English rather than Hebrew and Ugaritic as a career. After all, the Bible has been available in English for centuries now. Besides that, the canon is larger—from Beowulf to Bible and beyond. Reading is, after all, fundamental. I only discovered BookRiot recently, and that through the mediation of my wife. For the writer of a blog I really don’t spend that much time online outside of work. I like real books, and being outdoors. Too much time staring at a screen brings me down. Nevertheless, BookRiot has stories that cause me to question my career choices from time to time. For instance, I have never knowingly heard of The Exeter Book. Dating to the tenth century, this medieval manuscript is among the earliest of English writings. Showing the interests of the monk who likely inscribed it, it has religiously themed material and riddles. As E. H. Kern’s post on BookRiot points out, The Exeter Book has inspired many later writers and has, through them, made its way into mainstream popular culture. Not bad for a book that I suspect many, like myself, have never heard of. Old English has the same kind of draw as other ancient languages. Not nearly as dusty as ancient Semitic tongues, it contains the roots to the form of expression I find most familiar. I love looking back at the Old English of Beowulf and spotting the points where my native language has remained relatively unchanged over the centuries. Modern English even begrudgingly owes a considerable debt to the Bible of King James. Our language is our spiritual heritage. We have trouble expressing our deepest thoughts without it. Perhaps had BookRiot existed when I was young, I might have made a rather more informed decision about the direction of my career. Or, then again, religion might have found me nevertheless. From some things there is just no hiding. Would you buy a Bible from this man? “The trade is not a complicated one,” quoth Big Dan Teague. People are looking for answers. To making a living selling Bibles, however, requires some finesse in a world where scripture may be had for free. The trick is added value. Now, for those who approach this from a religious angle the obvious question is how you add value to what is claimed to be the word of God. It is, however, a matter of understanding it. Martin Luther, apart from starting the Protestant movement, also translated the Bible into German. The concept was simple: if the Bible contained the truth, the whole truth, and nothing but the truth, then if the laity read it, we wouldn’t need priests. Greek and Hebrew (and a smattering of Aramaic) are no longer the main elements of a well-rounded education so we need a version that anyone might read. Even the King James is a little rusty, what with words that don’t mean what they seem to—who wants to suffer? Especially in the biblical sense. Contrary to Big Dan’s assertions, the Bible trade is a complicated one. The text of the Bible (if not specific translations) is in the public domain. The Bible is, however, more than words. It is ink, and paper, and binding. It is an object. By swearing with your hand on it, you can convince the court you’ll tell the truth. Or become president. Or raise a lot of money. Despite the Bible’s decline in academic prestige, it remains a source of popular trust. Not too many items that can be had for free can make such claims of power. It is the book that founded western civilization. As I board a plane for San Diego, I know that I’m about to see lots of Bibles. Lots and lots of Bibles. Thousands of scholars who spend their lives studying it will gather to discuss its continuing significance and debate its finer meanings. Some will venture to purchase new Bibles. New versions of old words. See what others have to say about them. Somewhere distant I hear Big Dan breaking a branch from a shade tree. This, like most patterns, repeats itself endlessly. Some with tenure will argue that the whole thing ought to be abandoned. Others, forever denied tenure, will vociferously disagree. “One, find a wholesaler, the word of God in bulk, as it were.” And so the debate will continue long into the night. And over the weekend. In fact, ’til Tuesday. 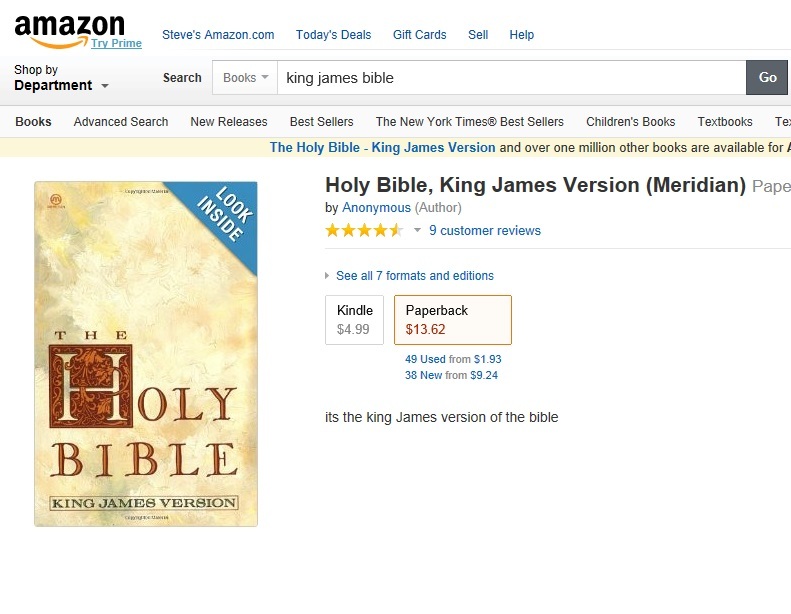 The King James Version of the Bible is in the public domain. (Except in Britain, where it is still royal prerogative to print the King James, and it has be licensed to Oxford and Cambridge University Presses.) In any case, that means that just about anywhere in the world, anyone can take the text of the King James, reproduce it, and sell it. In this day of electronic books, that means many King James Bibles are available online, as well as in print. Just look on Amazon. The other day, I was looking for King James editions when I noted a dilemma. 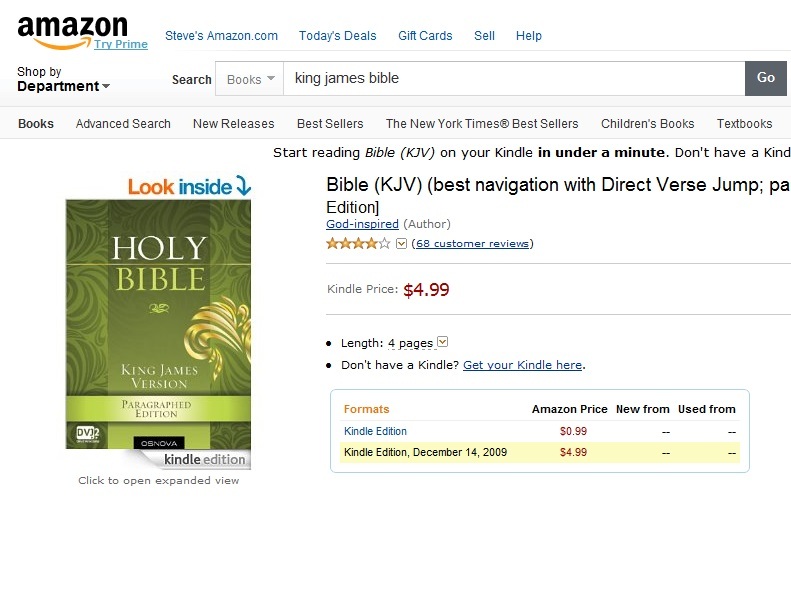 When you’re listing your Bible on Amazon, who do you cite as the author? Seems pretty bold to list yourself as the either author or editor of the KJV, so there have appeared a number of improbable authors of late. The first one I noticed listed the author as El Shaddai. Either an Amy Grant fan or an educated reader, this editor chose the phrase generally translated as “God Almighty” as the author. A good, strong name. It may derive from the phrase “god of the mountains,” or a bit more racily, “god of the breasts.” El Shaddai was likely a pre-biblical god that eventually got merged with Yahweh. The second version (which looks the same to my untrained eye) lists a trinity of authors: Holy God, King James, and Joy Mayers. What a triumvirate! I’m not sure who Joy Mayers is, but I would certainly blush in the presence of gods and kings. Particularly Holy God. Interestingly, this is not exactly a biblical title for the deity. We do get the encomium “holy” applied to God, but I’m not sure that it ever appears as a name. Well, at least we can look up King James and Joy Mayers. The next edition I found listed the author as the safely hedged “God-inspired” (hyphen and all). The problem is that God-inspired might be taken a couple of ways. One, and likely the intended way, is to see the author, whomever it may have been, as divinely inspired. Another option, and one which sounds more exciting to me, is to think of a coffee-fueled deity scribbling away under the heat of inspiration. The inspired god, writing under a nom de plume, gave us the King James (if that was his real name). The last one I found was the most parsimonious. The author was listed as Anonymous. This comes the closest to the historical truth of the matter. We know very little about the writers of the Bible. Probably the best attested is Paul, along with his companion Pseudo-Paul. We know this historical person wrote a number of letters. There’s little reason to doubt that people named Matthew, Mark, Luke, and John wrote some gospels. Who these people are, we don’t rightly know. Once we get back to the Hebrew Bible we find authors writing about their own deaths, and events that take place thereafter with embarrassing frequency. It could be that people saw further back then, not having to strain their eyes at a computer daily. Of course, if it weren’t for computers, we couldn’t sell our own Bibles on Amazon. I’m just waiting until I learn the actual author’s name before I post mine for sale. 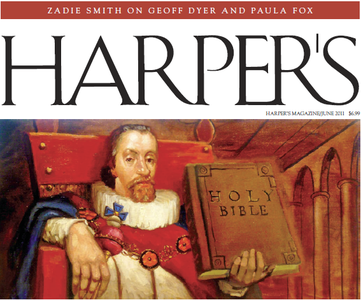 Celebrating the four hundredth birthday of the King James Bible, last month’s Harper’s magazine featured seven popular writers giving their take on various passages from the Bible. Noting the Bible more or less gave the English language its shape, this little exercise in eisegesis represents, in small measure, the power of the Bible even today. While many lament that America is no longer Bible-centered, with its misuse and abuse in the political arena the Bible still seems to be the heavyweight champion of the country, albeit altered through the eyes of certain key players. I was happy to note Harper’s chose novelists and poets to respond rather than theologians, biblical scholars, or—God help us—televangelists or politicians (frequently the same thing). What emerges is a tapestry that alike puts biblical scholars’ teeth on edge and makes fundamentalists wince. The Bible is a work of art on a broad canvas. Today it is frequently criticized for the abuses it endures, but if we allow it its original purpose the view should become more sympathetic. The Bible was composed by individuals struggling with ideas. For millennia it served as a useful guide to the human experience until the church became politically powerful during the reign of the emperor Constantine. From that point on, deep knowledge of the Bible became power. For centuries the church guarded that power, keeping it in the hands of the clergy. Now that the Bible has become democratized, it threatens to take over democracy itself. Out there, somewhere unseen, the original artists are snickering as they chink their glasses and toast their accomplishment—they are writers who changed the world. But I suspect Paul is there too, warning them against partying too much. Four centuries ago a literary landmark was published. Today marks the birthday of the King James Version of the Bible, arguably the most influential book ever published in the English language. Those active in scholarly circles at bibliocentric institutions are popping the cork on their sparkling grape juice today, since for many the King James Bible represents the real liberation of God’s message. In some sense, the KJV also represents the origins of Protestant movement. Liberating the Bible from the clutches of scholarly Latin, Greek, and Hebrew, the King James Bible made the book accessible to the English-speaking world. As direct access to the Bible grew, the pontifical power of Rome (with apologies to besainted John Paul II) came increasingly under question. Inquiring minds wanted to know what God himself said. Of course, the Bible soon enough would evolve into a lash in the able hands of power-hungry theocrats. 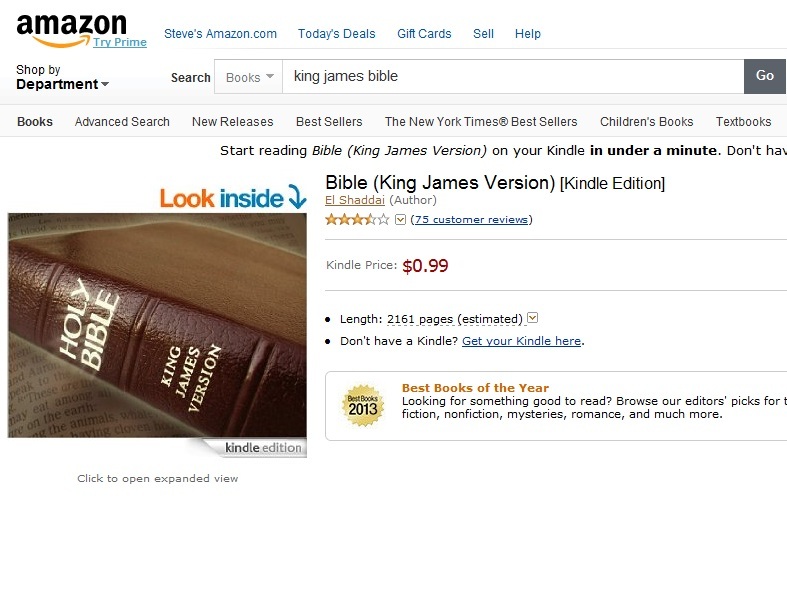 Today the New International Version outsells the venerated King James. Some very conservative groups still hold to the King James Version as an “inspired translation” that no others can touch. The New International Version was hailed by evangelicals as a more up-to-date, safe translation of the Bible when it first appeared. The fact remains, however, that translations can never fully replicate the original. This is a major problem of bibliolatry. Languages are systems of thought and direct translation never fully captures the “meaning” of the original. Few who adore the Bible have the time to truly learn Hebrew and Greek, so guardianship of the truth must be passed to a reliable translation. The King James, in turn, also became the basis for some shaky theological ideas that are challenged by more accurate translations. As the Internet rings with stories of the death of Osama bin Laden, the dangers of absolute religious adherence to any book of faith should become clear. Bibles, Qurans, Talmuds – these may be guideposts along the way, but they are often mistaken for the end of the journey. Written texts are subject to interpretation and even the KJV is read different ways by different believers. Instead of worshipping books, we would be better advised to read them. And if from that reading we learn to think then the time of the original composers of sacred writ will not have been wasted. That would be cause for celebration indeed.